In an era where ‘easy and fast’ has become the trend, many artisans have shifted to more modern means and methods, which allows them to cut production time and hence, meet the demand of the masses. But in doing so, the objet d’art loses some of its meaning, its history, its function. Individual artisans end up getting tangled in the constantly-turning wheels of business, creating ‘dehumanised’ products. Take lacquerware for example – once a prized object of art that requires meticulous attention from its artisans and could take months to complete. 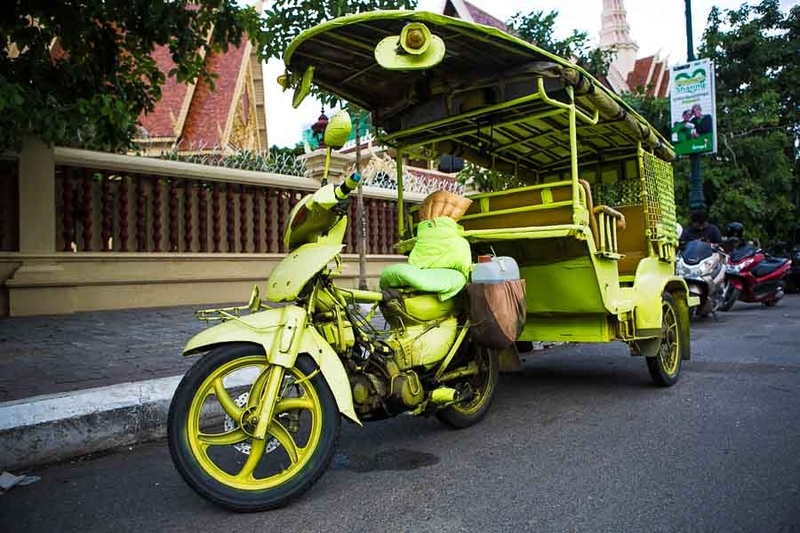 What was once a symbol of status and in many cases in conservative Cambodia, a symbol of religious devotion, has now been reduced into a mere souvenir. It is increasingly becoming an object to be purchased for the sake of it, which utterly belies the complexity of the process that each artisan has to go through to complete each work – the simplest of which takes at least a month to complete. But will the advent of technology and modern methods inevitably turn the art of crafting lacquerware – which has been crafted and traded along the famed Silk Road for hundreds of years – obsolete? Will consumers have to be content with characterless lacquerware items that are being hawked by numerous vendors just about anywhere? 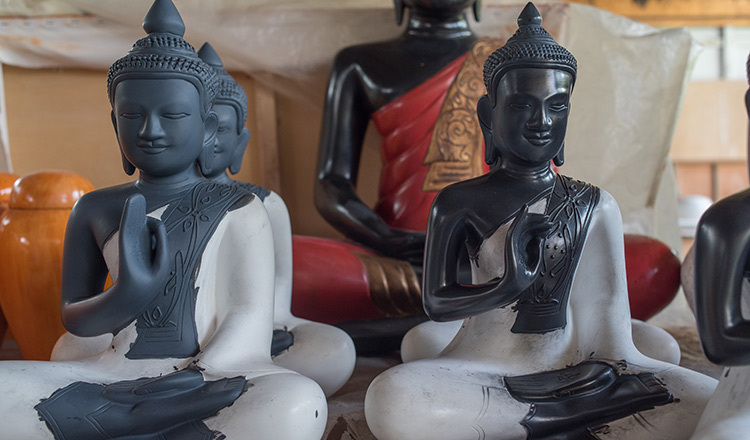 This is where brothers Eric and Thierry Stocker from Angkor Artwork come into the equation. With decades of experiences on lacquerware restoration, they have been leading the preservation and promotion of traditional, all-natural lacquerware that still employs traditional materials and techniques since 2008 – with a twist. Immediately, Mr Eric led everyone to the front of his workshop set in an expansive gardens, which as it turns out serves more than just an outdoor space to relax. “To even begin to understand the process, one has to understand the very basic ingredient – that is the resin from the lacquer tree,” he said. 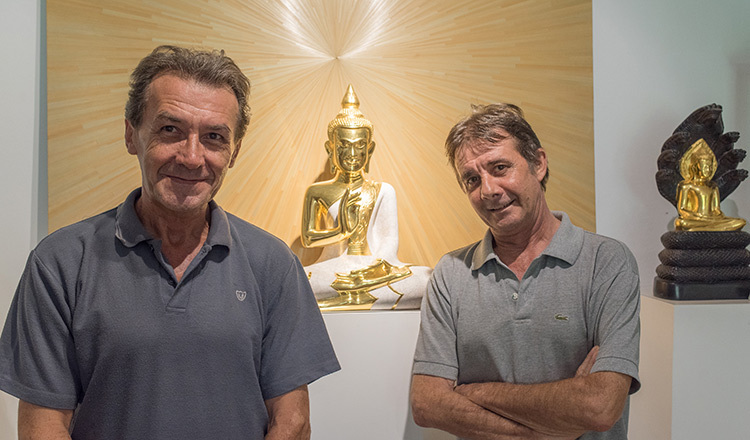 Brothers Eric and Thierry Stocker, who aim to preserve and promote traditional lacquerware, opened Angkor Artwork in 2008. The three species of lacquer in Asia, explained Mr Eric, has different colours and characteristics. While the resin of the Japanese lacquer tree is clear, lacquer from the Korean Peninsula and China tend to be amber in colour. “Southeast Asian lacquers are darker,” explained Mr Eric as he showed the molasses-like, sweet-smelling resin that has yet to be processed. “We source our resin locally. Currently, we maintain around 100 trees in Kampong Thom, where our affiliated farmers care for them and collect the resin from the trees each day,” he continued. But unlike gum, resin yields are minuscule to say the least. A day’s worth of tapping could probably yield around 300 milliliters of resin, but considering that the Stocker brothers require an average of 300 kilograms of resin in a year, and compounded by the fact that lacquer resin can only be tapped during the monsoon, one may begin to wonder: why are they sticking to this time-consuming, labour-intensive process when shortcuts abound? Mr Eric gestured to a nearby lacquer bowl and peered into it. “Natural lacquer somehow makes the object more three dimensional, more so than it is,” he said. In Mr Eric and Mr Thierry’s studio, bowls are obviously not the only objects on display. From tie boxes to jewellery cases, ring boxes to candle holders, even large lacquered collages that are overlaid with gold, silver and copper leaves, their atelier truly reflects the brothers’ keen attention to detail, quality, and variety. Little wonder then that Mr Eric and Mr Thierry have been commissioned by the likes of Cartier, Hermes and Louis Vuitton to provide them with their lacquerware products. This operation – considering the labour intensive and time consuming nature – will not be possible if it were to be ran just by the brothers. In fact, their workshop is staffed by 19 local artisans who are being trained to produce quality lacquerware. 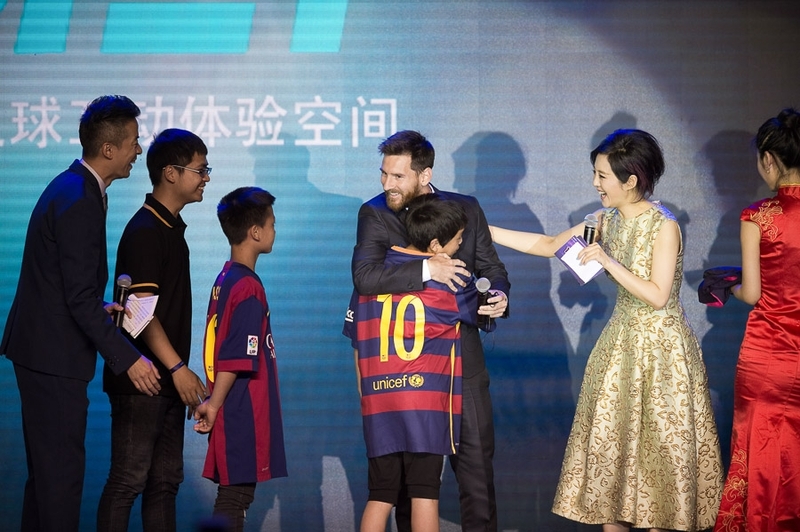 “It takes up to five years to master the craft, it really is not an easy endeavour to take,” said Mr Thierry. “As foreigners living in Cambodia, we are lucky to be able to call this place our home and to earn a decent living,” finished Mr Thierry.